Di-Corp offers a premium Casing Bit set to bit gauge. It is best suited for more difficult overburden drilling conditions including boulders. It offers increased life with increased diamond concentration and extended impregnation depth. 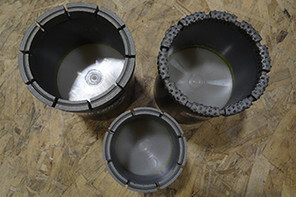 Casing Bits are used in deep, difficult overburden when a casing shoe is not sufficient to drill to depth. Note: The inside diameter of the casing bit is set to bit gauge therefore the core barrel will not pass through freely, the crown must be drilled through.